No Cost Income Stream Reviews - Legit or Scam? No Cost Income Stream Reviews – Legit or Scam? The “No Cost Income Stream” job opportunity from Eric Holmlund, Paul Counts, and James Wellman claims that there is a way to generate income online without spending any money on websites or advertising. According to their video presentation, it’s very unfortunate that most people who have the biggest desire to create an online business are the same people who do not have a lot of money to invest into a business opportunity. They created their no cost business training system compiled of 39 step-by-step videos to help these very people, and they are currently selling their training program for just $17, a discount off of their regular price. The No Cost Income Stream says that they are basically an affiliate marketing training program – affiliate marketing is a system of making money online where you partner with other companies to promote their goods or services. If your promotions result in a sale, you will earn a commission. Traditional affiliate marketing often requires business owners to invest a lot of money into either maintaining a website, or into advertising costs, or both. But NoCostIncomeStream.com says that they can show you the best free places to promote your links online, as well as the software and services you will need to make this system work, including 13 “no cost” traffic generation methods. No Cost Income Stream is correct when they say that most affiliate marketing training systems go out of their way to misrepresent the kind of money that needs to be invested into creating this business. In addition, they speak openly about how their system doesn’t require the use of your own website and how they will teach you to utilize free methods of gathering traffic and advertising, two factors which are extremely important to making money online. Customers who are interested in trying out the information they have to offer can purchase their entire system for an initial cost of just $17, and since this is a Clickbank product, you have 60 days to request a full refund if you are unhappy. One thing to always be careful of in these situations is money they may ask for after you have paid the initial fee – in order for any follow up fees to be covered by this money back guarantee, they must also be purchased through Clickbank, otherwise you are not assured of safely getting your money back in situations where you may be unhappy. 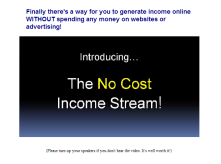 No Cost Income Stream ?